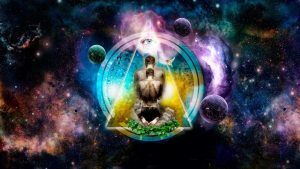 Your reality which is not actuality is an Illusion: Your higher conscious self-knows that your physical outside world that you experience as your reality is an illusion. It knows that your circumstances, whether wanted or unwanted, are simply a reflection of your inner world which itself is a product of your thoughts. It knows that your reality is the mirror that allows your conscious self to experience itself. In this knowledge, your higher conscious self is always still and at peace. It observes your success and your failure, your joy and your pain knowing that it is all a dream. Where your conscious mind is the commander and your subconscious mind the subject, your higher conscious self is your kingdom. It is in reference to your higher self that the Christ said “the kingdom of heaven is within”. All three aspects are One – varying degrees of a singular Mind, itself pure energy vibrating at different frequencies. You already possess it all you need to do is to become consciously aware of it. When you learn to consciously program your subconscious mind under the protection of your conscious mind and the direction of your higher self, you will see miraculous transformation in all areas of your life.